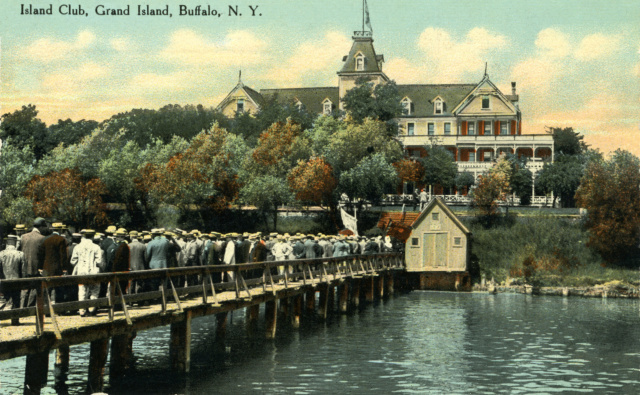 Most of us have heard of the Bedell House resort on Grand Island, but did you realize that at the turn of the last century, more than a dozen resorts dotted the shores of the Island? On May 9, Grand Island Historical Society members Curt Nestark and Mary Cooke presented a PowerPoint program covering many of the posh private clubs and fabled resorts where Tonawandans flocked to escape the dirt and noise of their industrialized environment. The resorts offered a multitude of activities from the most elegant to the mundane; formal dinner to cookouts, croquet to horseshoes, garden walks to bicycling, and even carriage rides around the island. For thrill seekers there were amusement rides at Edgewater and the power boat races sponsored by the Buffalo Launch Club.